For a seasoned player with full-time experience on the felt, entering the fray of a casino poker room can elicit a variety of emotions: excitement and anticipation to be sure, but most likely a blend of complacency and boredom. The clamor of chips riffling, the din of intense discussion and the grim countenances of gamblers trying hard to make an easy living — these sights and sounds are merely background noise for a poker pro. For the rest of us, however, a scene such as this can be quite intimidating indeed, which is why many recreational players find their first foray to the casino to be an unnecessarily unpleasant experience. 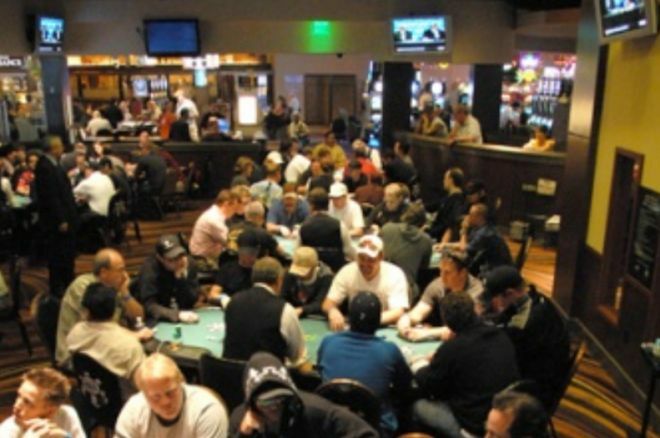 A packed poker room can often resemble a clubhouse of sorts, table after table ringed with players seemingly in uniform, wearing headphones and a hoodie while conversing in coded language. To an outsider simply trying to find his or her seat, the maze of low- and high-limit tables, each one featuring games contested with chips of every color, can be a little unsettling, especially at first. Poker is a game best enjoyed in comfortable confines, and while regulars at every casino consider their hometown poker room to be a veritable home away from home, newcomers are occasionally left with the sense that they have encroached on unwelcome territory. That the vast majority of players absorb a financial loss during their first crack at casino poker is no coincidence, and while their deficit in skill is obviously a contributing factor to that trend, feeling out of place and unfocused clearly cannot help their cause. For these reasons, I am convinced that recreational players attempting to transition from the dining room to the poker room for the first time can benefit immensely from an introductory visit to their local casino. In other words, consider doing a little “poker room reconnaissance” beforehand before joining that first game. If you have a friend who plays in the room on a regular basis, by all means employ him or her as a tour guide, but this reconnaissance mission can easily be conducted on your own. The key element in this exercise is acclimating yourself to the unique environment found in every poker room, so there is no need to worry about your bankroll or hand selection just yet. Instead, simply study how the room and its various components work together, so when you return to actually play poker, your full focus will remain on the game at hand. The entrance to every poker room begins with the board, which depending on your location may be a spectacular array of high-definition screens, or a simple clipboard hung from a podium. In any event, you must add your name to the list for whichever game you prefer to play. If you have obtained a player’s card and the casino facilitates automatic registration, you need only swipe your card at a nearby kiosk, and click to select the game or games you’d like to play. By the way, getting a free player’s card is often a good idea not just for helping with registering, but also to get you “comps” — that is, complimentary items or services in exchange for playing (e.g., a free meal at the buffet and more). You can also go the old-fashioned route and speak to the staff member manning the board. Don’t be intimidated by regulars jostling for position and shouting their initials. The protocol here is to clearly state your name or initials, followed by the betting limits of your game of choice, and the staff will call announce your name when a seat is available. Knowing the password to provide a poker room’s gatekeeper may seem obvious after you’ve signed up for a few hundred games, but everyone has to start somewhere. On this initial visit to the poker room, take a few minutes to observe how their board is organized, and next time you’ll have no trouble getting to the game you actually want to play. You’ll notice most players making a beeline from the board after registering, as they head directly to the cashier’s cage to purchase their chips. This is because most prefer to have a rack of chips at the ready when sitting down to play, rather than waiting for the chip runner to return with your stack after you are seated. Again, this process may appear to be complicated to the uninitiated, but you need only state your desired amount and the color to obtain your ammunition. While unfamiliar at first, the mantra of “three-hundred, red” will eventually become engrained in your consciousness... especially after a few rebuys. Trust me. Either before or after this first information-gathering visit, take some time to check out Linda Geenen’s ongoing series “A Look at House Rules” to learn more about the ins and outs of how poker rooms operate, including articles focusing on how players are seated, how the games are managed, and other specifics of game play that are useful to know. Having completed your “reconnaissance” and answered questions in advance in this way, when you return to play you’ll know what steps to go through before taking a seat, thus freeing up your mind to engage in the particular process of mental preparation you prefer. Peruse a complimentary poker magazine, soak in a little sports action on the big screen, or simply study the actual play of your potential competitors. Whatever works for you, so long as you enter the game in a calm state of mind, at the ready to make quality decisions in the heat of the moment. An introductory visit to the local poker room can work wonders in terms of helping you calm down and focus on playing your best game. Rather than becoming distracted by the finely tuned machine humming all around you — and worrying unnecessarily about your place within it — you will come to view the poker room as a fun place to be, and refuge from the real world. Registration will become routine and purchasing chips perfunctory, and soon enough, you’ll be a regular waiting impatiently behind a rookie struggling to get their name on the board. And when that happens, remember your roots and offer a helping hand, because as you very well know, we’ve all been there before.